The world’s most popular DAW is 20 years old, and what better way to celebrate than with a whopping great update? In any other industry, two decades would be an astonishingly long product cycle. However, in the domain of DAWs that have dominated for 35 years, at 20, FL Studio is merely matured - and given its origin as a simple four-track MIDI drum machine, that’s actually an understatement. Image-Line’s DAW has, in fact, evolved into a production powerhouse, complete with its own comprehensive collection of effects, instruments and inspiring add-ons, and a unique interface offering a viable alternative to the homogeny of competing products. Yet FL Studio often - and unfairly - gets a bad rep as the dabbler’s choice. Admittedly, it’s ideal for drumming up grooves on the grid, and its breakneck default BPM and initial 16-step pattern sequencer only adds to the perception. However, FL Studio is truly a turn-key solution, having long offered users an unparalleled palette - assuming they weren’t trying to cobble together a complex progressive rock opus on a Mac. With the newly issued FL Studio 20 (actually its 13th incarnation), even those exclusions have been lifted, including the biggest of all: its former Windows-only status. 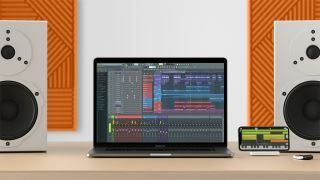 Indeed, FL Studio 20 can now be used natively on any 64-bit Apple computer - no need for Wine or any other wrapper. More impressively, current FL Studio license holders need pay nothing extra for the Mac version. And yes, lifetime updates are still very much a thing! There are of course, plenty of other new features in this anniversary edition, too, and here we're going to run through 11 of the best. For more FL Studio 20 tutorial action, get the Autumn 2018 edition of Computer Music. FL Studio now previews audio signals as they’re recorded. This feature is commonplace in many other DAWs, and though it’s a late arrival, we’re pleased as punch-ins to see it introduced at long last. It’s comforting to see your waveforms when tracking. You’ll now know instantly if something’s amiss, such as improper gain levels or a bad connection. Takes are grouped when recording in looped mode. Another feature familiar to old studio pros, this function automatically contains multiple passes in a looped recording into a grouped collection of adjacent tracks, facilitating the creation of comped tracks from multiple takes. Once again, Image-Line are stepping up FL’s capabilities to meet the standards expected by pro users. This is apparent throughout the program, but sound designers and sample jockeys will be especially pleased with the Edison audio editor’s newfound 24-bit WAV export option. In the past, Edison supported only 16-bit and 32-bit export. Thanks to user demand, Image-Line have stepped up! FL’s newfound Mac compatibility brings with it the ability to access Apple’s Audio Units plugin format. Yes, you can now use your favourite AU instruments and effects in FL Studio. Be warned, though: any Audio Units without a Windows counterpart (and vice-versa) will obviously hinder a project’s cross-platform compatibility. One of our favourite FL plugins has a couple of new goodies worthy of attention. First, right-clicking the Send control displays the names of all slice mixer track destinations. Also new: in the Regions menu, you can now choose a new ‘Select all cut groups to’ option, which will allow you to lash all slices to the same user-defined cut group. When it comes to latency issues, convolution effects can be particularly problematic, as they’re required to perform a massive amount of calculations to give you the most realistic effects possible. Thankfully, Fruity Convolver offers a dedicated PDC (Plugin Delay Compensation) control, activated via a button above the impulse display. Now, correcting impulse response delay is a truly effortless process. Fruity Reeverb 2 has always been a great tool for adding realistic ambience to your tracks, and now FL’s classic reverb is even better, thanks to a brand new modulation section. Ostensibly meant for smoothing out the unnatural metallic ringing often imparted by algorithmic reverbs, you can push both Mod Depth and Mod Speed values to more extreme and unusual places. The new Mini-Preview scroll bar gives you an instant overview of and access to your playlist’s various components. This is handy when you’re zoomed in tight on the actual playlist. As an added bonus, you’ll find a similar preview in the piano roll, as well. Here comes one we’ve long waited for! Now FL Studio’s Toolbar is totally customisable. You can edit your toolbar to your specific needs, and save it for later recall. The Toolbar editor mode is most impressive, allowing you to drag and drop whatever elements you want to include wherever you like. You can even pin the Toolbar at the bottom of the FL Studio window. Ever worked up a killer, complex arrangement only to discover that you needed to create an alternative version for, say, a remix or collaboration? Maybe you need to provide a client with multiple variations? Such a demand might once have required renaming, editing and saving an entirely new version of the project. Not any more: now, FL Studio can create and collect multiple arrangements in the same project. The selected version is the one that will be bounced on export. 11. Old is new again: the Graph editor is back! FL Studio users have made their wishes known, and Image-Line have dutifully capitulated with the return of graphic editing in the pattern step sequencer. A right-click on the sample in the Step Editor brings up the familiar interface. It’s a quick way to tweak velocity, panning, levels and notes. Plus, graph editors can be resized, and you can scroll through them with your mouse wheel.